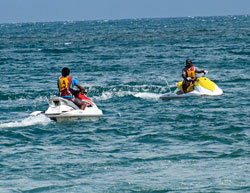 By calling our Jetski-safari tours office direct at +679 3450 933 from anywhere in the world. 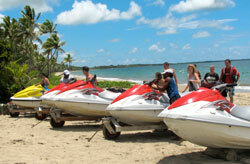 By arranging reservation through your travel agent and or resort activity manager while in Fiji. By sending us an e-mail direct through our website form. Click here. By booking in advance through our website On-Line booking page. Click here. 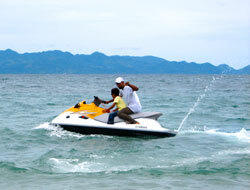 We operate the Jetski-safari Adventure tour 7 days per week. The tour depends pretty much on the weather, and the weather canditions in Fiji can change rapidly few times during the day ;-). We monitor it closely however, and advise on any forcasted adverse conditions ahead. It is crucial thou that you call us after arrival in Fiji and leave your contact details so we can coordinate timing of our tours. Stll, it is always warm to hot here and the water temperature close to 30 degrees Celsjus. Some call it nice we call it "paradise". * Please read our tour pricing structure and cancellation policy when booking the tour. * We offer free transport witin the Pacific Harbour area. We can also arrange pick up and drop off from any resort and or any place in Fiji at your cost thou or you organise it yourself.